With nature’s fury before us in hurricanes and wildfires – with the impact of those two horrors on so many people it may seem wrong to celebrate nature’s beauty. I don’t believe that to be true. Maybe that’s because I am one of those fortunate enough to have been spared the fury. For now. Like natures beauty you cannot escape the fury. So today I celebrate the beauty. It impacts me every day. From the tiny purple violets that greet me in my backyard every year to the glory of the changing colors in the park across the street, nature’s beauty is all around us. If only we stop to see. Autumn in Wisconsin has many faces but most days are cool and filled with sun and color or gray and drizzle. The first is fantastic and the second – meh. 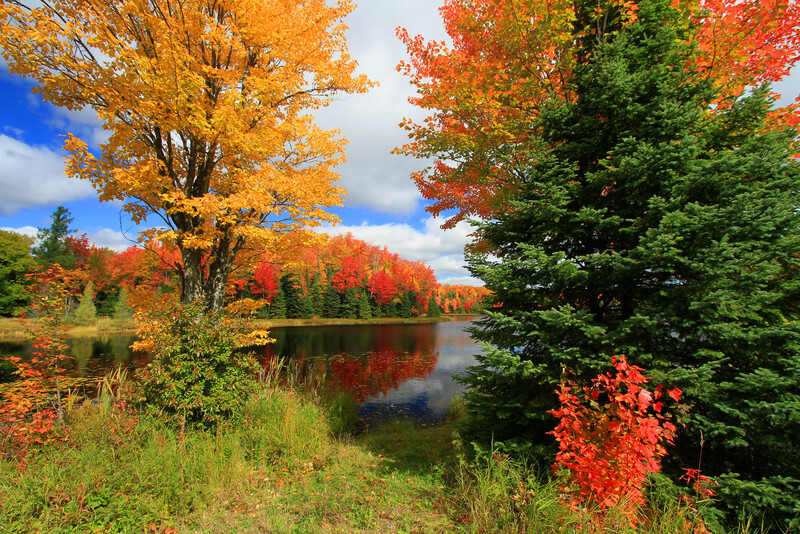 The image below is of northern Wisconsin in the autumn. I know New England thinks it has the bragging rights about color but you would have a hard time topping the color in this picture. 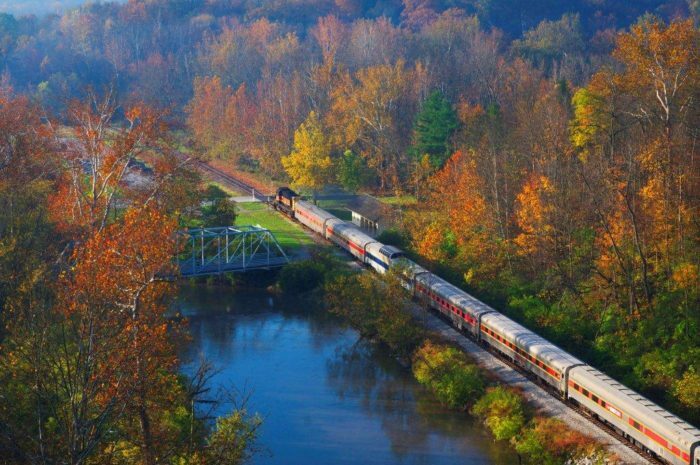 The Cuyahoga Valley is simply stunning in the fall, with an array of colors you can’t get during any other season. 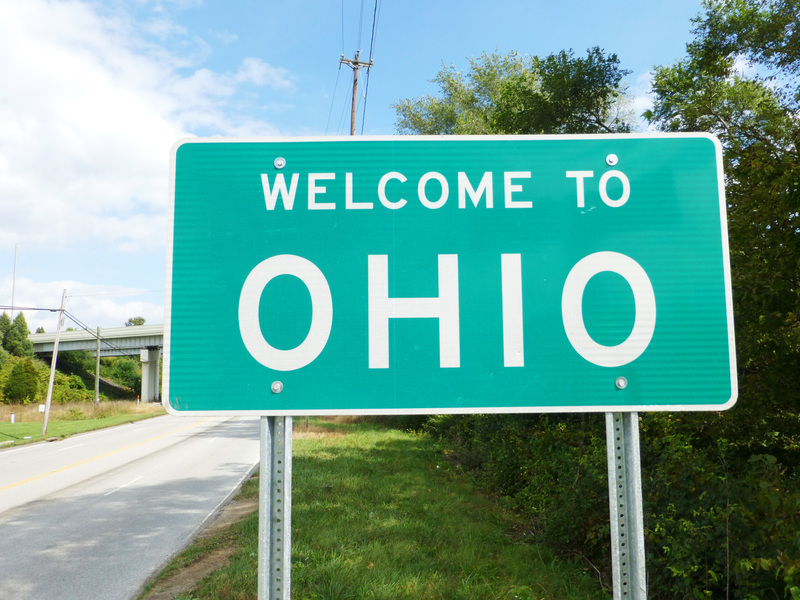 Ohio has plenty to brag about when it comes to beautiful fall colors. We don’t often think of beautiful fall color in the south. Yet this is simply stunning color at the Reserve at Lake Keowee. Not the same as in the north when the weather changes so greatly in the fall but a subtle palette of beauty all it’s own. The Big South Fork National River and Recreation Area preserves the Big South Fork of the Cumberland River and its tributaries in northeastern Tennessee and southeastern Kentucky. Keep your eyes peeled for moose or elk along the Blackfoot River on Highway 200 out of Missoula in northwestern Montana. Other areas of Montana are alive with different and more vibrant colors. I liked the subtle yellow, ocher, green and gray outlining the magnificent moose. 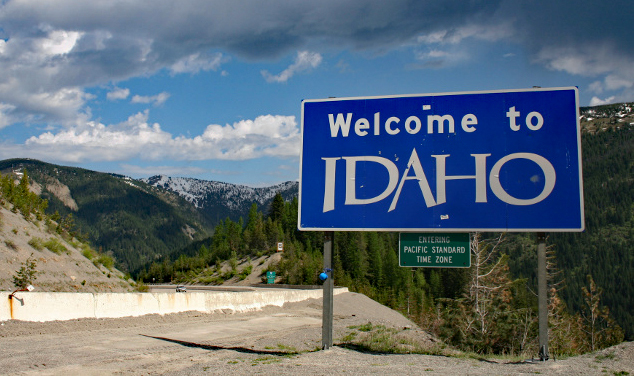 For Idaho, like for most of the other states there are so many images of beauty that it difficult to choose one to post. Beauty is in the eye of the beholder and once my eyes beheld this I was a captive. There are many other different and glorious images but this one captured my heart and eye. Idaho, east, waterfall where Fall Creek Meets the south fork of the Snake River. Georgia peaches and pecans are the first things that enter my mind when I think of Georgia. But a little research turned up this magnificent autumn beauty. 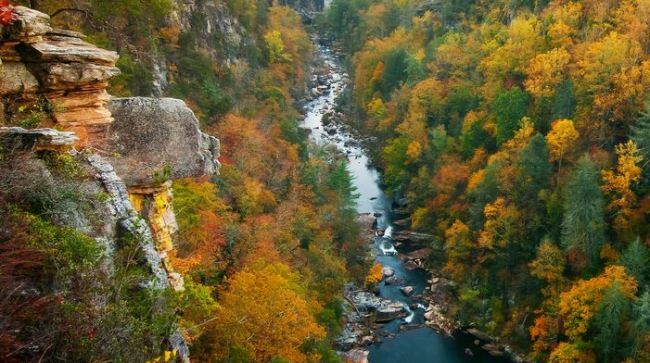 One of the most spectacular canyons in the eastern U.S., Tallulah Gorge is two miles long and nearly 1,000 feet deep. Visitors can hike rim trails to several overlooks, or they can obtain a permit to hike to the gorge floor (100 per day, not available during water releases). A suspension bridge sways 80 feet above the rocky bottom, providing spectacular views of the river and waterfalls. North Dakota in all it’s autumn glory is breathtaking. Until I set out on this journey I had no knowledge of the Pembina Gorge. 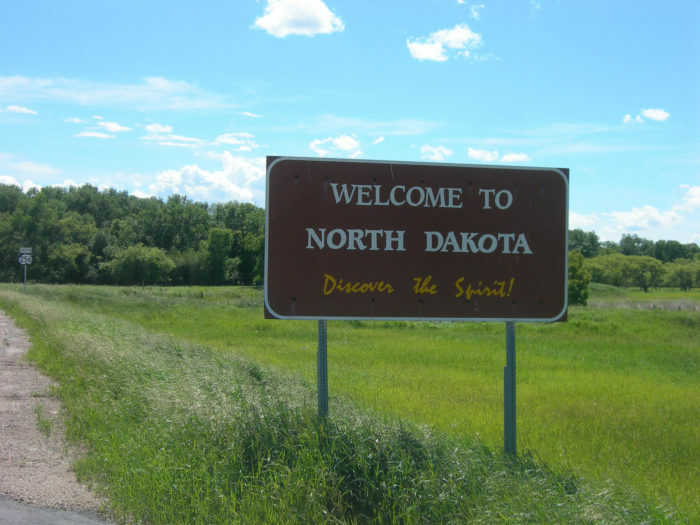 And that shows how little I know because my father was born in Minot, North Dakota. 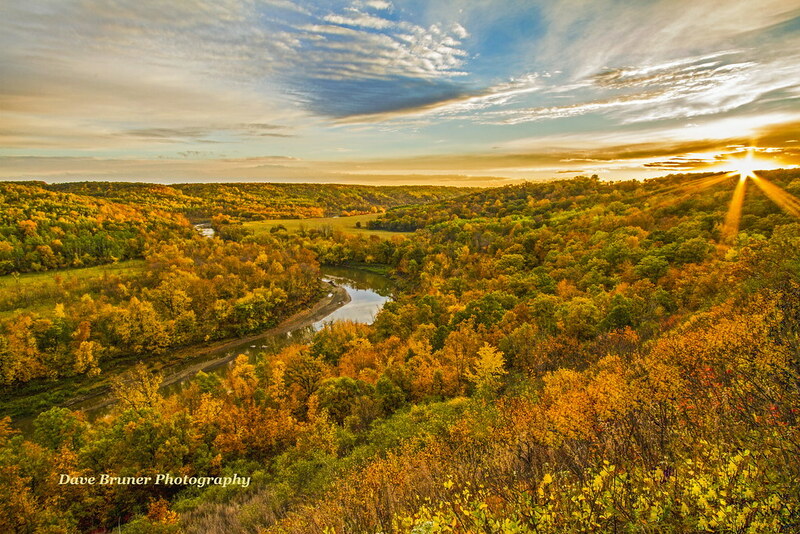 The Pembina Gorge in North Dakota at sunset with prime Fall Colors in late September 2013. I know little or nothing about Oregon and I am ashamed to admit it. But the beauty in this image speaks to the heart. 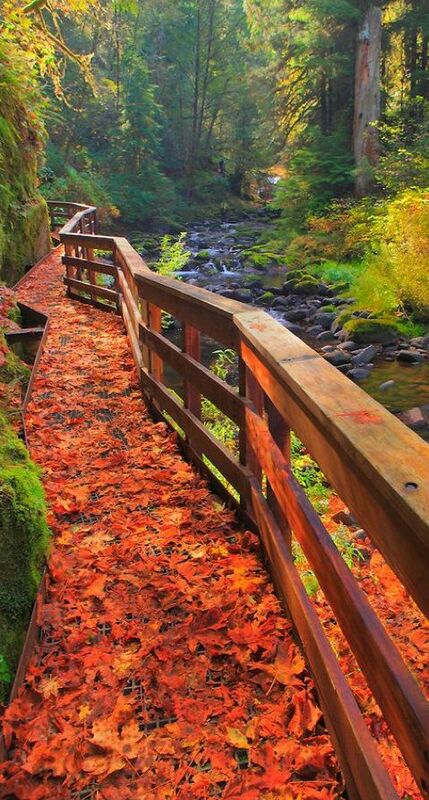 Sweet Creek Trail, Mapleton, Oregon in the fall. Another beautiful place I didn’t know existed. The color is, as always, glorious and the history interesting. 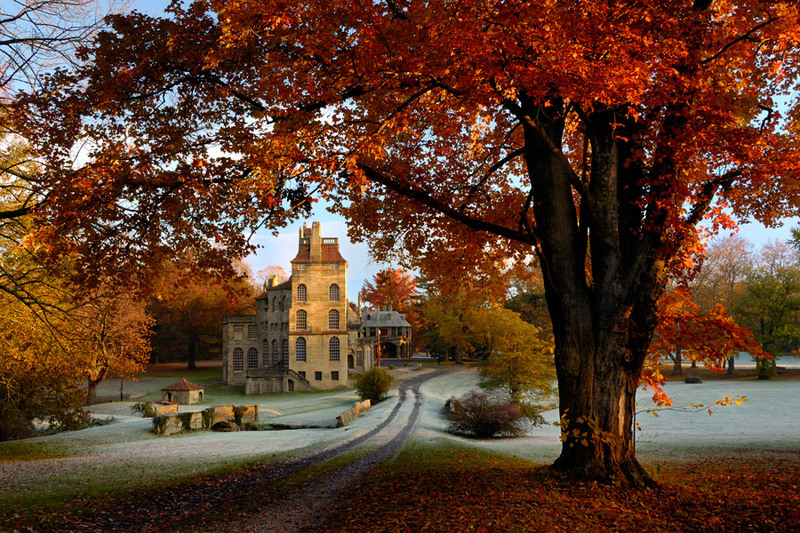 Fonthill, also known as Fonthill Castle, was the home of the American archeologist and tile maker Henry Chapman Mercer, in Doylestown, Pennsylvania. Built between 1908 and 1912, it is an early example of poured-in-place concrete and features 44 rooms, over 200 windows, 18 fireplaces, 10 bathrooms and one powder room. The home was individually listed on the National Register of Historic Places in 1972. That’s just a sampling of the beauty of our great country. From the hurricanes coming in from one shining sea to the wildfires threatening so much near the other shining sea. We can, and should be aware and concerned about the fury while still seeing the beauty. Such is life. Good and bad. Today I choose to celebrate beauty. Christian vs atheists. I’m talking about the difference between people who are good and decent and people who are vile. 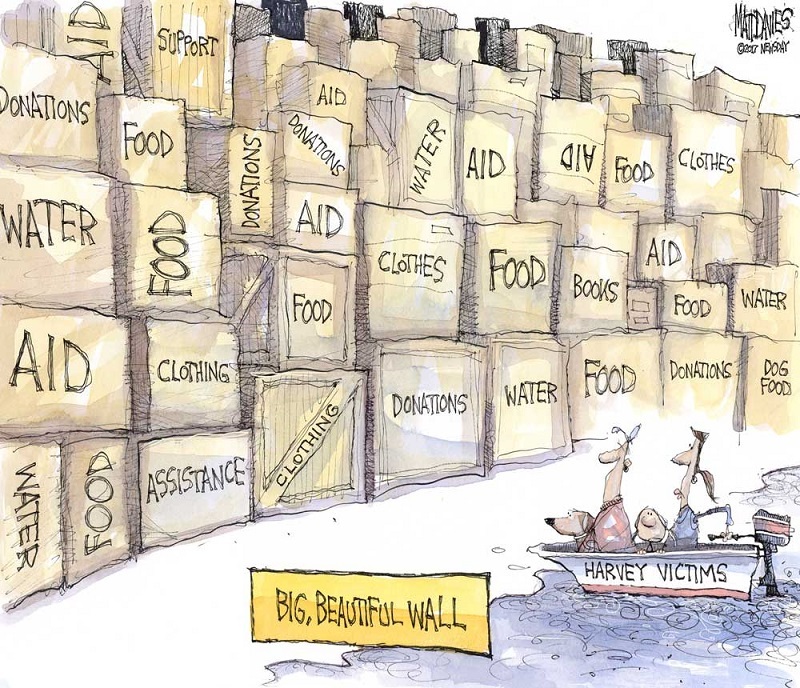 When disaster strikes our fellow citizens “we”, the good and decent people, want to help. Thousands help others as best they can and our newest heroes may be a neighbor with a bass boat. 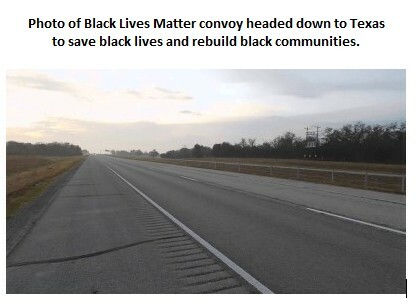 Good people drive from nearby states or from far away states to help. Neighbors unaffected feed those who are storm tossed and cold and hungry and unable to go home. Guess the term “Locked and loaded” is suddenly okay again. 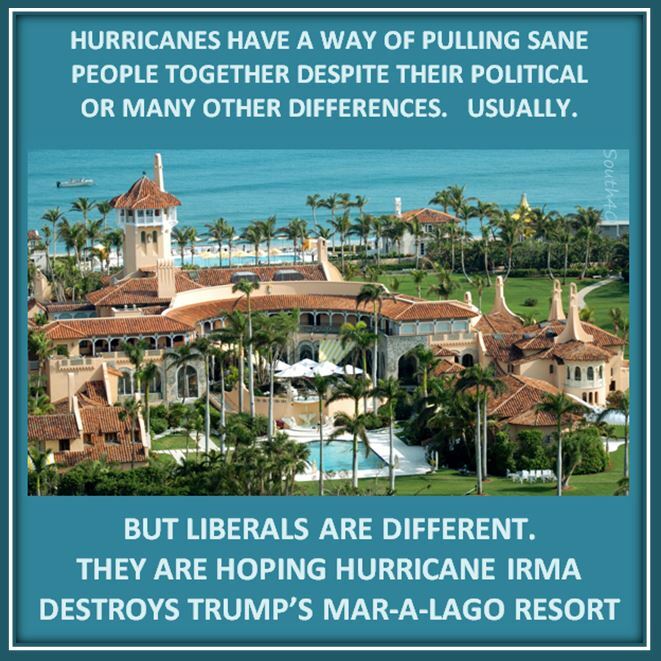 Millions of people are being asked to evacuate because of the biggest storm in Florida’s history, and you make it about Trump’s property. So who would be cold-blooded enough to savage hurricane victims? Rabid sufferers of Trump Derangement Syndrome (TDS). These are people who were so blindsided by a Clinton loss that they can’t see past their election night rage and are wishing destruction on all the Trump voters in Florida along with Trump properties. I don’t want to be neighbors with these kinds of people anymore. I don’t even know what this cretin below is – Human being? Barely. As Texans reflect and recover from the devastation that came with Hurricane Harvey, comedian Bill Maher told his audience Saturday night that the survivors have no right to ask for federal aid. 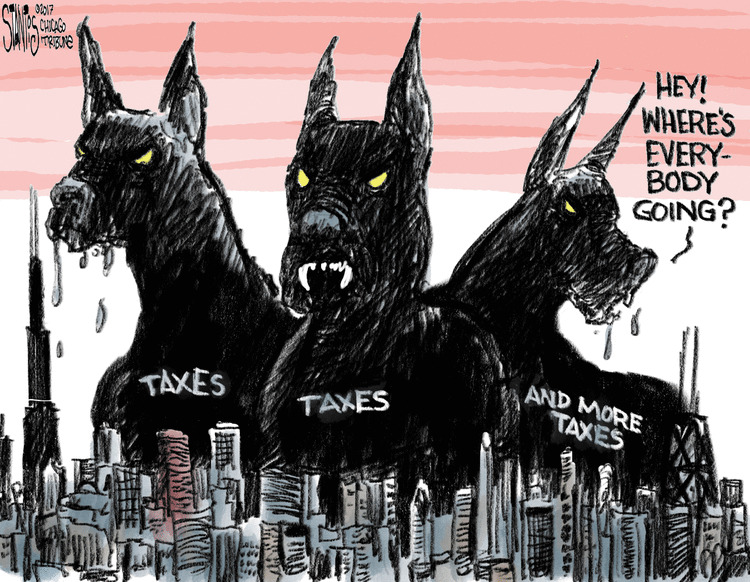 Texans have a “low tax base,” he argued. 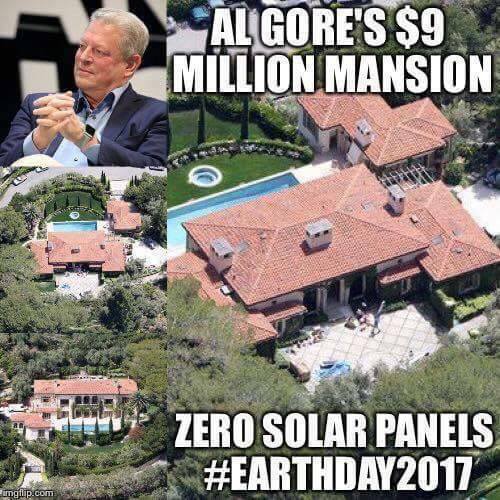 Oh, and they don’t believe in climate change. 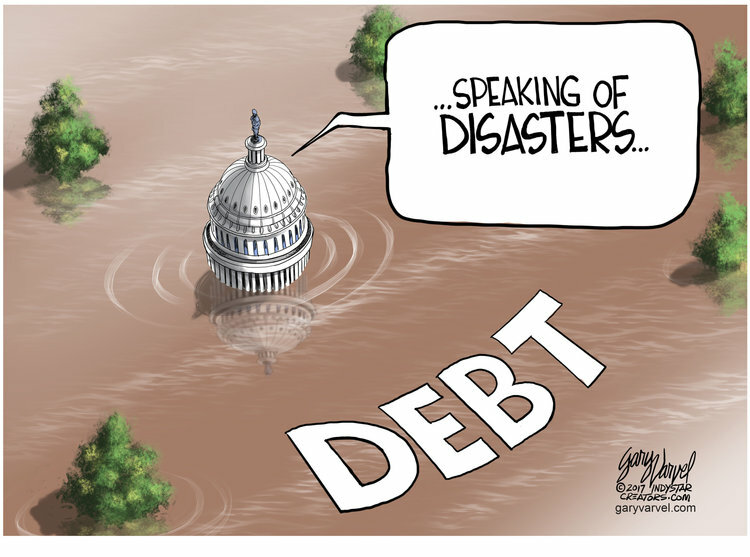 Why should Washington bail them out? We don’t need A.F. Branco to tell us this about the climate change crowd. But he does it with such panache. Needless to say, he’s one of us. While I usually excoriate the ignorant celebs who will not stop talking about things which they know little or nothing about, there are a few, a very few, who actually have a brain. And knowledge. People that know what they are talking about and have the courage to speak out knowing full well they may never work in “tolerant” Hollywood again. James Woods is one of us. And he’s one of the smartest of us with a wicked way with retorts. Coming at us from the left are folks that supported this woman who, if there were justice in this country, would be facing a grand jury. 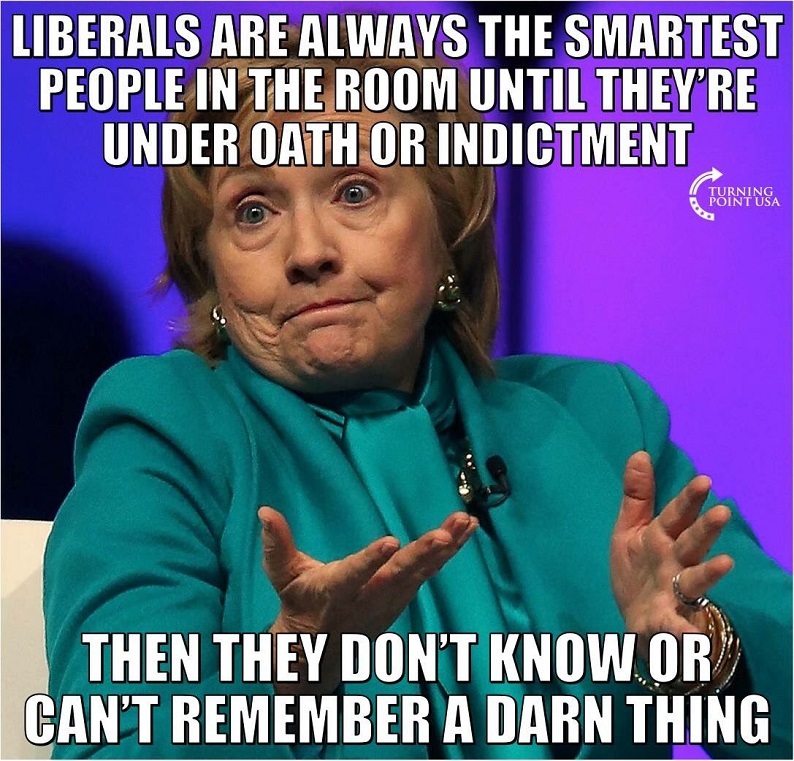 It’s just my opinion but liberals may “think” they’re the smartest people in the room but like so many other things, they’re wrong about that. Do you like the idea that some travelers from another world would look at us, at this time in our history, and find us ignorant savages? The image below made me think about that. We always hear that the “world” is watching us. Maybe the universe is watching us and have decided, via the “Prime Directive” not to interfere in our culture until we pass the primitive and barbaric and have advanced sufficiently to join them. We seem to be stuck in “tribal” in spite of all our technology. Note to public – having a “smart” phone doesn’t make you smart. If we want our claim of being good, decent people to have any validity then we must be fair. We must not rush to judgement and we must not fall victim to hyperbolic language. Too often I read on blogs that “all” liberals are bad, evil, stupid, or some other derogatory remark. How does that make us different than those on the left that claim all Trump voters are bad, evil, stupid or whatever? Or Hillary calling those voters deplorable? There are plenty of nasty small-minded people on both sides of nearly every issue. Most politicians cannot be trusted to keep their word and that makes them one of them 😈 not one of us 😇. 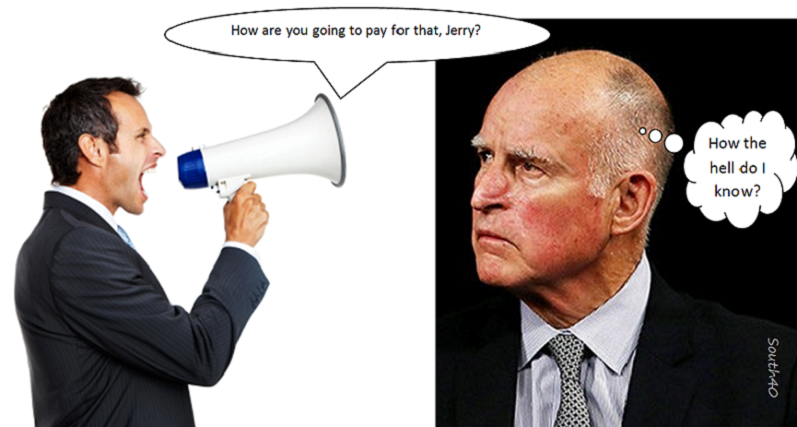 Hero worshiping a politician is like teenagers worshiping some celebrity or sports figure – not suitable adult behavior. Good decent people don’t wish bad things to happen to other people. We may not want bad people to win elections or run our schools or feed us tripe and call it news. Both of my neighbors are Democrats. One is a loud mouth that we can barely tolerate, but we do for the sake of peace. The other does as we do and usually keeps his political opinions to himself. This year he and we pretty much agreed that voting was a waste of time and energy since there were not good options. He didn’t vote at all, his wife voted for Hillary and we voted Evan Mcmullin and that was a waste too since he’s turned out to be a nitwit. But when winter came we helped each other with shoveling snow, as we do every winter and when they go on vacation we watch their house. It’s the neighborly thing to do. 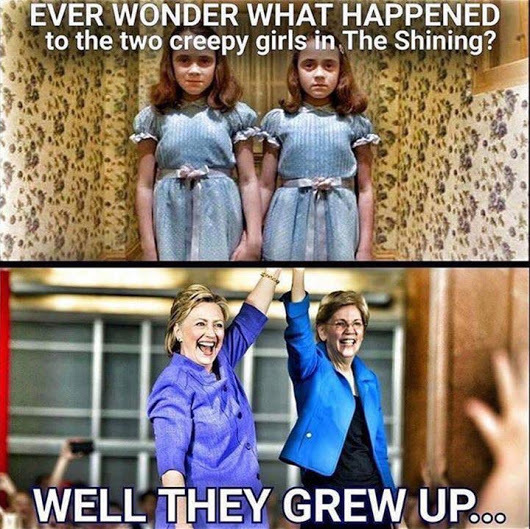 Should we not because she dared to vote for Hillary? Or are we Americans that believe in freedom and that she has as much right to vote for Hillary as we did for the nitwit? I try very hard not to be one of them. I know there isn’t even a chance that I would wish a hurricane or any other of natures horrors on anyone. The worst I tend to wish on those I don’t like is laryngitis or hemorrhoids. And that’s mostly for politicians and media types. 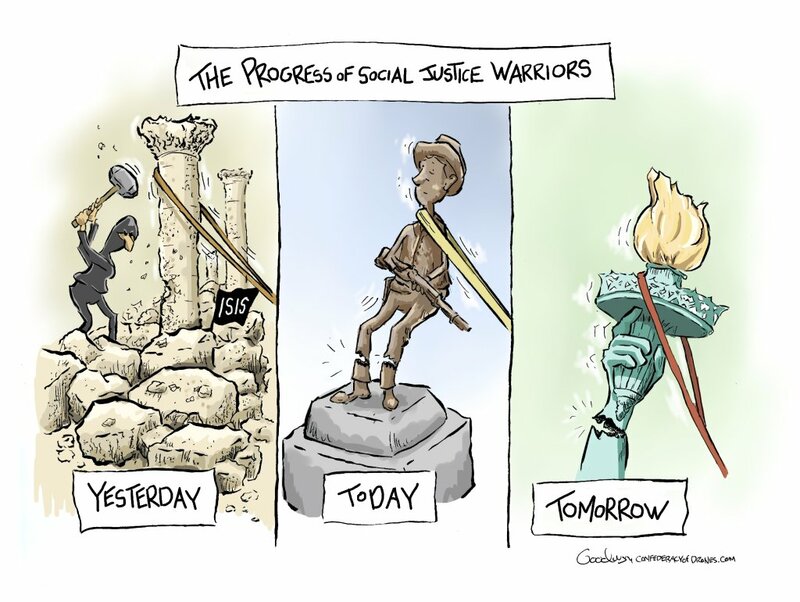 The cartoon below is what we mostly are and should strive to be. Let’s not let them 😈 make us 😇 less than we can be. There was a time when I spent every Sunday morning glued to the television to watch the Sunday Morning political talk shows. Those days are long past. Once they lost all pretense of fairness or honesty I lost all interest. Now I search out things that interest me. Am I biased? I am. But I admit it and I still want the truth even if it isn’t a truth I like. Media might try that sometime. Some articles and cartoons I found interesting. Derek Hunter: What Are Democrats So Afraid Of? Mention voter fraud near a liberals and you’ll see Pavlov’s Basic Principles of Classical Conditioning in action. 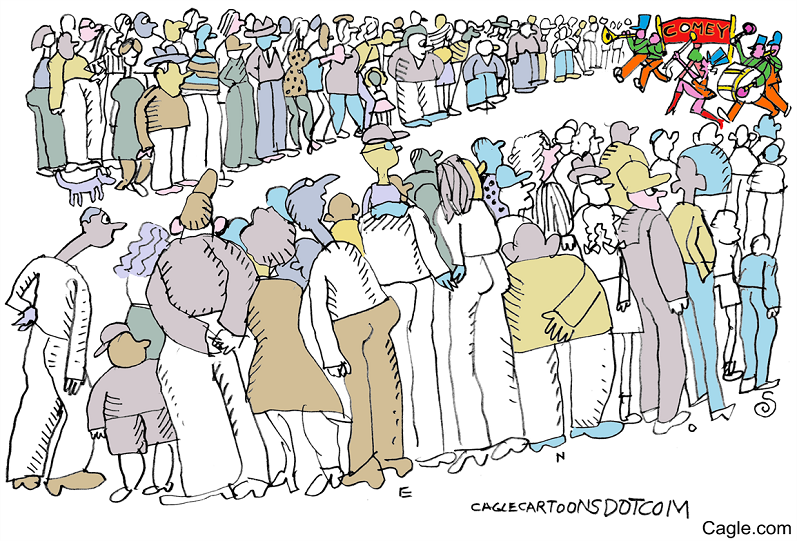 “There is no voter fraud,” they’ll instinctively say, then expect a treat. But is there something more behind their reaction than groupthink? The University of California in Berkeley was again the scene of violence recently, as protesters claimed license to silence those with whom they disagree. Their fight against “fascism” took the form of not just stopping a speech, but assaulting those who came to hear it. 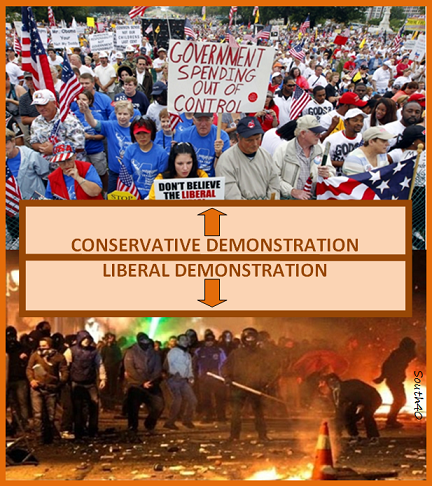 For those of us at universities and colleges, these counter-demonstrators, and in particular the masked antifa protesters, are a troubling and growing presence on our campuses. They have been assaulting people and blocking speeches for years with relatively little condemnation. They flourish in an environment where any criticism is denounced as being reflective of racist or fascist sentiments. Do you think I’m overselling how anti-white liberals (even white liberals) have become? If so, here are just a few recent headlines. Affinity Magazine wrote, “Actually… Straight White Men Are the Root of Our Problems.” The Root put out an article called “Polite White People are Useless.” A Boston University scholar said “Stephen King’s ‘It’ Is Bad Because It’s Full Of ‘White, Straight, Able-Bodied’ Males.” CNN also blamed ordinary people for being “white supremacists by default.” There were people on Twitter hoping Hurricane Harvey would help “cleanse” Texas of white people. Then there was this comment from Munroe Bergdorf, the first transgender model hired by L’Oréal. Rob Eno: Can we drop the charade that Jennifer Rubin is a conservative? The Antifa role in Charlottesville violence was widely glorified among liberals, who posted memes on social media comparing Antifa to the American soldiers who stormed the beaches at Normandy. The tide began to turn after Boston Antifa riots in opposition to a free speech event, where it was clear to the cameras that Antifa didn’t need actual fascists in order to beat people up. Since then, there has been increasing liberal condemnation of Antifa. A Politico report today, however, should blow the lid off the notion that Antifa violence was just a reaction to Trump or Charlottesville. To the contrary, Homeland Security and FBI documents reveal internal warnings about Antifa violence and domestic terrorism going back to early 2016. 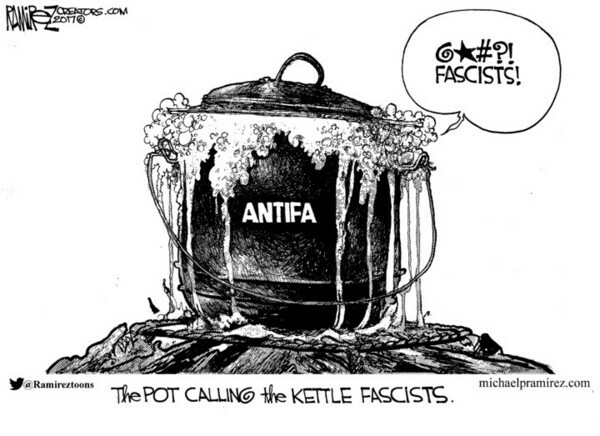 Federal authorities have been warning state and local officials since early 2016 that leftist extremists known as “antifa” had become increasingly confrontational and dangerous, so much so that the Department of Homeland Security formally classified their activities as “domestic terrorist violence,” according to interviews and confidential law enforcement documents obtained by POLITICO…. How did we go, less than a week after racist violence in Charlottesville, Va., from removing statues of Robert E. Lee to talking about obliterating edifices honoring Ulysses S. Grant and Christopher Columbus? The short answer is: “It’s human nature.” But I’ll amplify. “Disasters should not be politicized — it’s about people’s lives and getting their lives rebuilt,” New Jersey Gov. Chris Christie was telling Fox News anchor Neil Cavuto the other day. Christie wasn’t talking about the man-made mayhem in Virginia. He was talking about Hurricane Harvey. Yet in the next breath, he settled old scores against Texas senators and congressmen who voted against Hurricane Sandy relief. Enjoy your Sunday and Labor Day tomorrow. 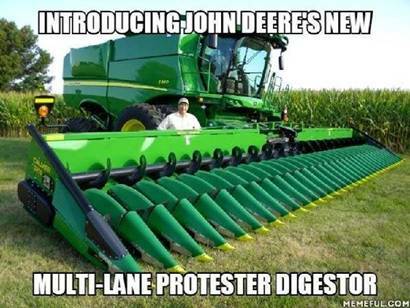 I can hear the griller crowd starting their engines all ready. 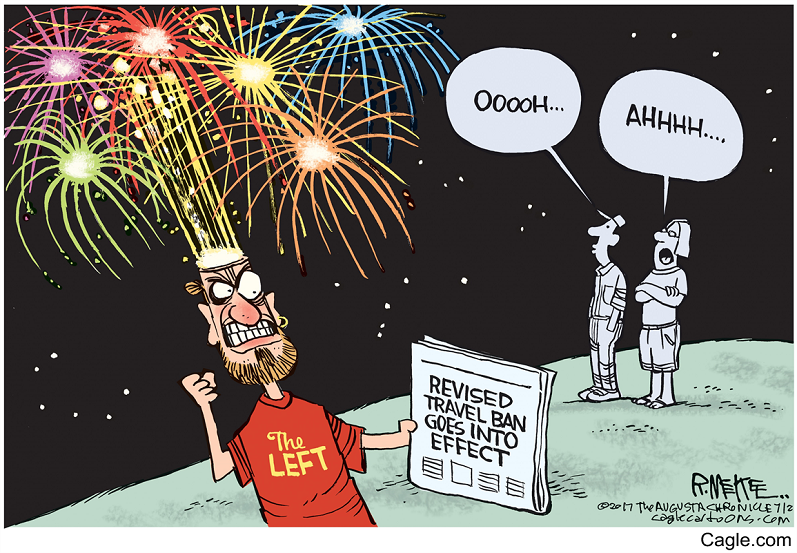 To celebrate this 4th of July I return once again to the wonderful cartoonists that I love. Their commentary is worth more and all the windbag politicians spouting rhetoric most didn’t write, most don’t believe and most don’t understand. Ditto the media. Patriotism coming from them is insulting to every true patriot IMO. 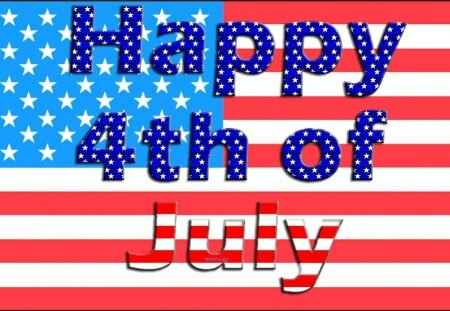 Independence Day greeting from John R. Rose, Byrd Newspapers of Virginia. Not one of my favorites most of the time but he did this holiday well. Dave Granlund is not one of my favorite cartoonists when it come to political issues. But he always does great holiday cartoons. 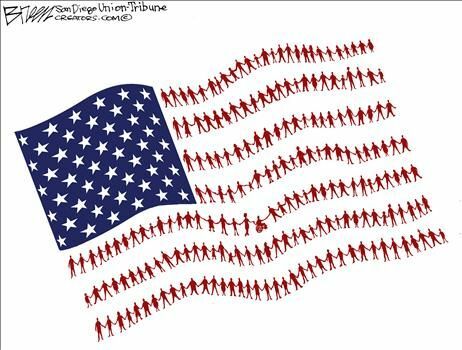 I think this one from Steve Breen of the San Diego Union Tribune is great. If you look closely you see men, women, children and someone in a wheelchair. It would have been easier to just do generic stick men – he took the time to do it right. I salute him for that. 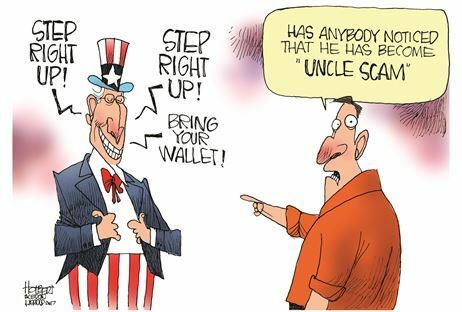 Okay maybe this one from Rick McKee is just a tad mean. Perhaps that’s the best thing about it, other than being true. 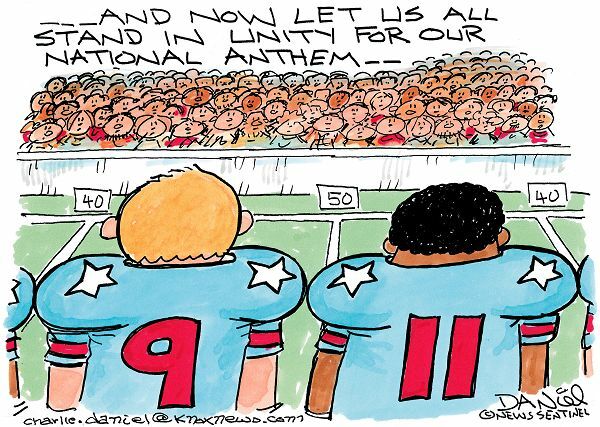 Lisa Benson is not the only cartoonist that focused on how divided we are as a country. But she did it very, very well. 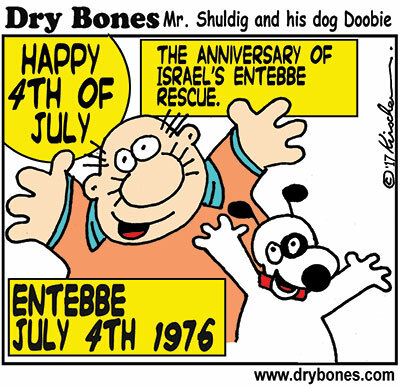 Doncha just love Dry Bones cartoons? 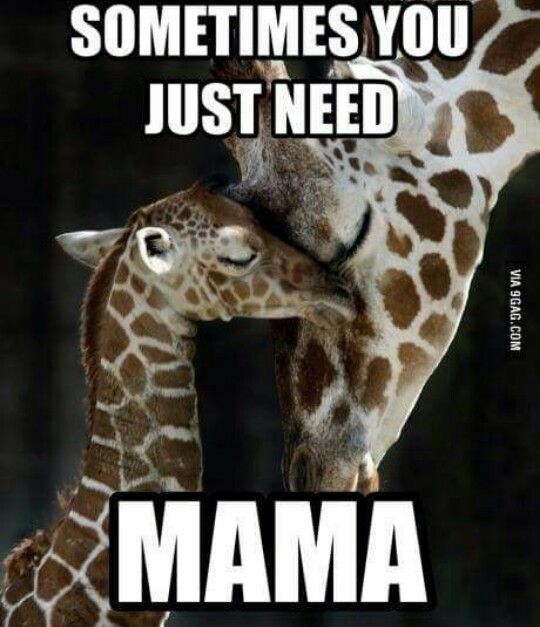 This one reminded me of something we should all remember. 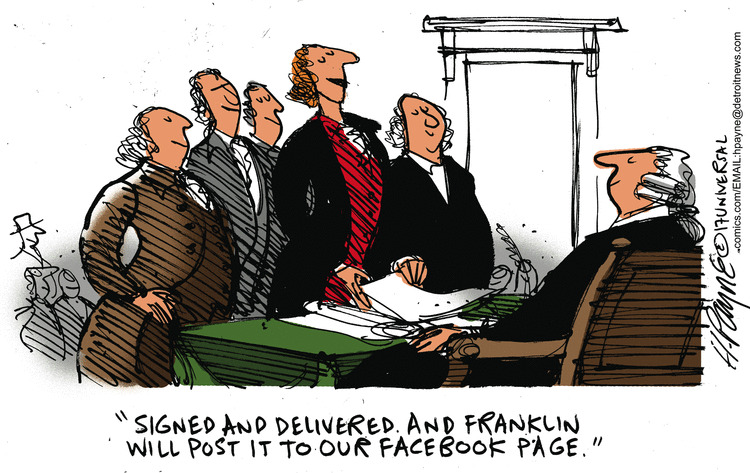 And then there is wonderful Bruce Tinsley and his fantastic Mallard Fillmore cartoons! 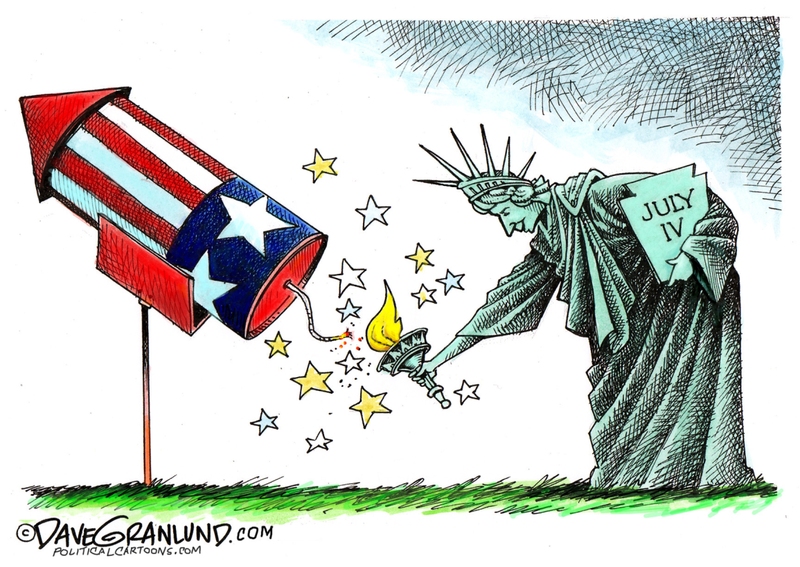 Here’s another great Dave Granlund Independence Day cartoon. I don’t like his politics much, or not at all usually, but he does great 4th of July! 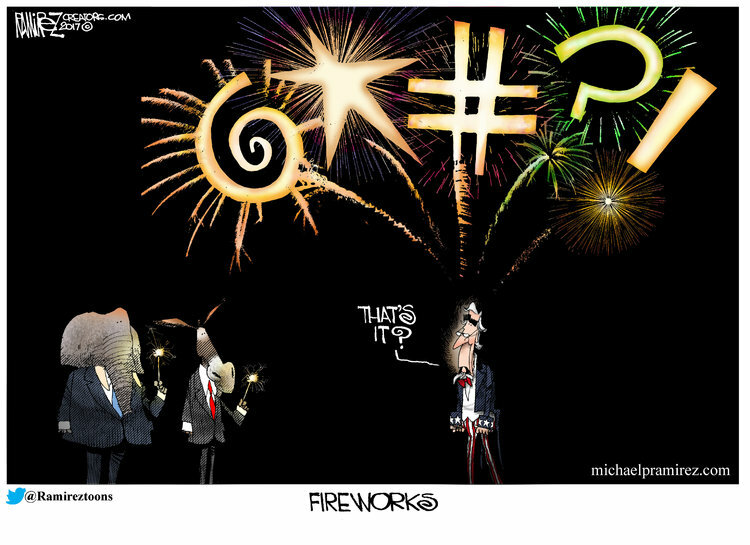 Brilliant Michael Ramirez skewers the political parties once again. And it’s terrific IMO. 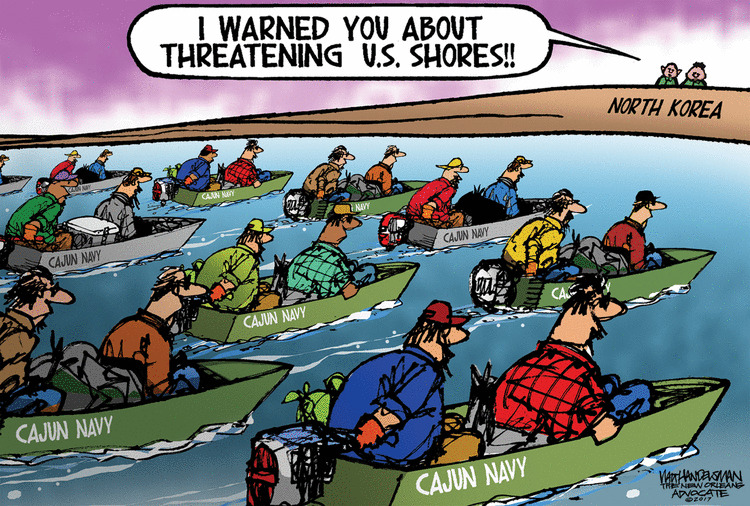 Walt Handelsman and his usual prescient commentary on the current culture. Henry Payne with his talent for bringing the past and the present into a slightly skewed focus that is funny and real. He’s a genius IMO. I also love his commentary. Nate Beeler of the Columbus Dispatch also focuses on our divided nation. I am a very big fan of A.F. 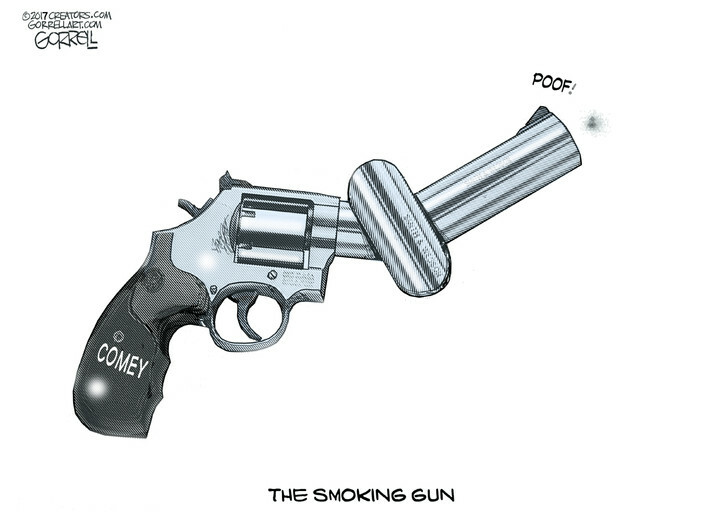 Branco but I find the following cartoon just a little too Trump fan club for me. Not that it isn’t true. 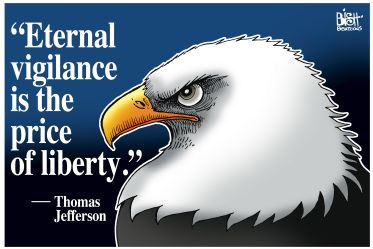 Randy Bish reminds us of an eternal truth from on of our founding fathers. 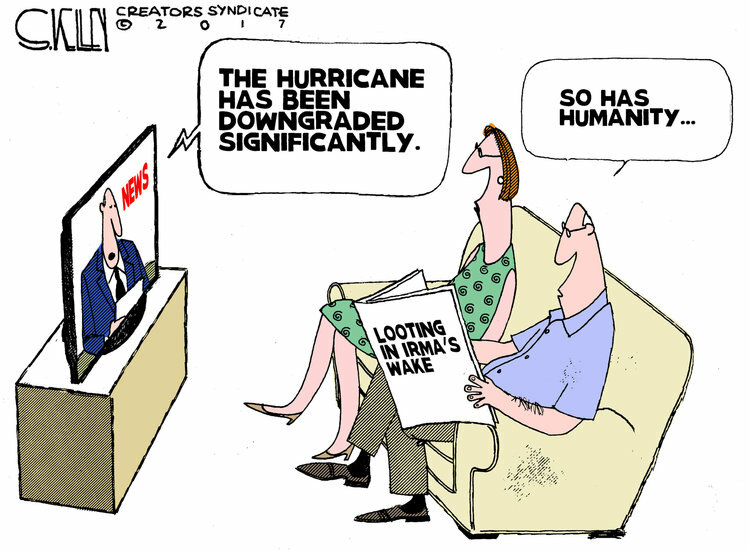 Jerry Holbert alerts us to an inconvenient fact. 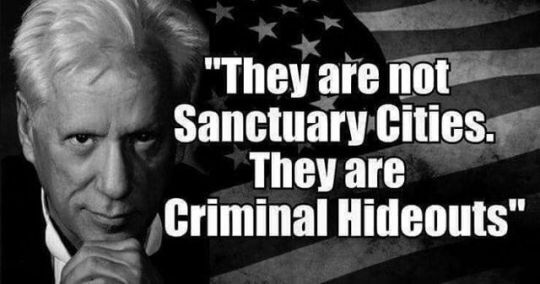 A fact that is beginning to be appartnet to a whole lot of Americans. Rob Rogers of the Pittsburgh Post Gazette reminds of us a sad fact we must confront. It affects all of us in one way or another. 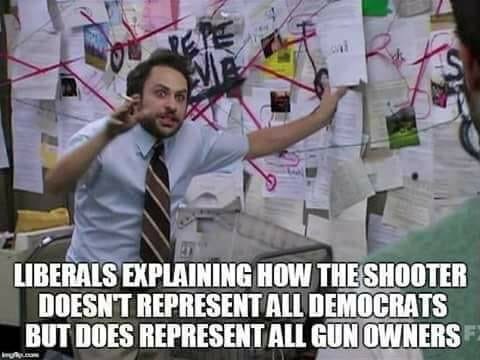 In the wake of the terrible shooting of Representative Scalise, the Capital Police Officers and the Congressional Aids I wanted to take the high road. I tried not to point the finger at the violent rhetoric that has come from the left since Trump was elected as the cause even though I believe that it contributed to the end result. Ultimately the one to blame was a sick, hominid, who felt, as so many before him that his misery or belief allowed him to kill others. It is never right. It is always wrong. However when in the wake of this terrible event certain disgusting elements of our society, mostly on the left but some anti-Trumpers on the right, attempted to place the blame for this Trump-hating individual’s action on Donald Trump, that’s just too much. Just. Stop. It. I expected, and saw, a lot of Kumbaya moments the past two days. I also saw some horrible people saying some horrible things. For a few moments even Nancy Pelosi, who never stops accusing her opponents of every unthinkable act under the sun, actually acted like a decent human being. I wish I believed she actually meant the decent things she said. The history of her rhetoric says not. Buried somewhere under the politician there may still be a decent human being. I doubt it. Sorry, I just do. For her and all others like her, you cannot relentlessly, remorselessly spew venom for days, years, decades and remain a decent human being. It simply isn’t possible. Pelosi on political discourse: it didn’t use to be this way, somewhere in the 90s republicans decided on politics of personal destruction. 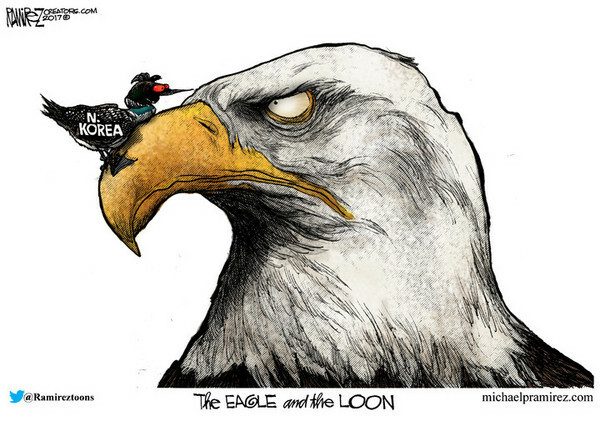 What I believe is expressed by a cartoonist I don’t usually follow because I don’t like his ideology or POV. But this time I think he got the hypocrisy of politics exactly right. Donald J. Trump acted presidential for a moment, and then he started tweeting again and ruined his moment. Mr. President, Just. Stop. It. Sen. Sherrod Brown accused a reporter on Wednesday of practicing “fake journalism” for asking whether Democrats have played any role in using violent, partisan rhetoric in the wake of President Trump’s election victory last year. Brown, D-Ohio, told reporters in a hallway interview that President Trump has chosen to “divide and name call” rather than serve as “the healer in chief.” When asked by the Washington Examiner if Democrats have also played a role in dividing the nation with their heated opposition to Trump and the GOP, Brown called that “a false equivalency” used by editors of newspapers, including the Washington Examiner and the Wall Street Journal. Unbelievable! What a creep! Just. Stop. It. I know it’s only pin-headed Mika but this is on national television and her new boyfriend didn’t push back much did he? Guess he doesn’t want to sleep on the couch. Any debate about civility in politics begins with Trump. No one has degraded discourse more, while embracing the fringe. Fact, not opinion. Because all was civil and kind and honest until Trump came along. Give me a frickin break! 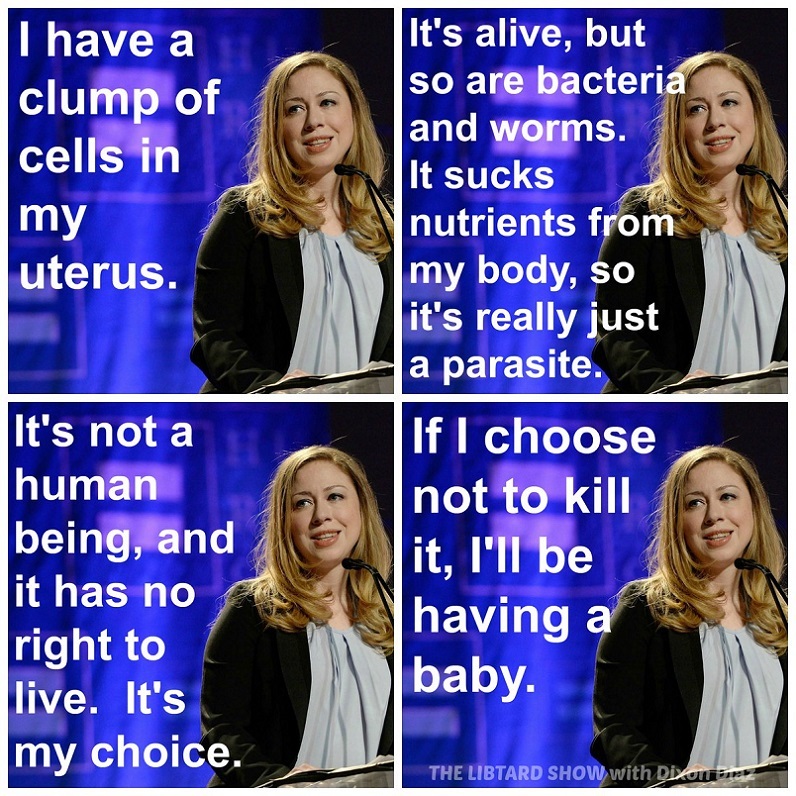 Who believes this drivel? I am not here to try to make the right seem like innocents. They too engage in hateful rhetoric. I’ve done it myself so – mea culpa. But I’ve seen little from Republicans that rises to the level of hate and ugliness we see all too often from the left. If I’m missing it then show me where. When a loony lefty does something terrible it’s always reported as an isolated incident. 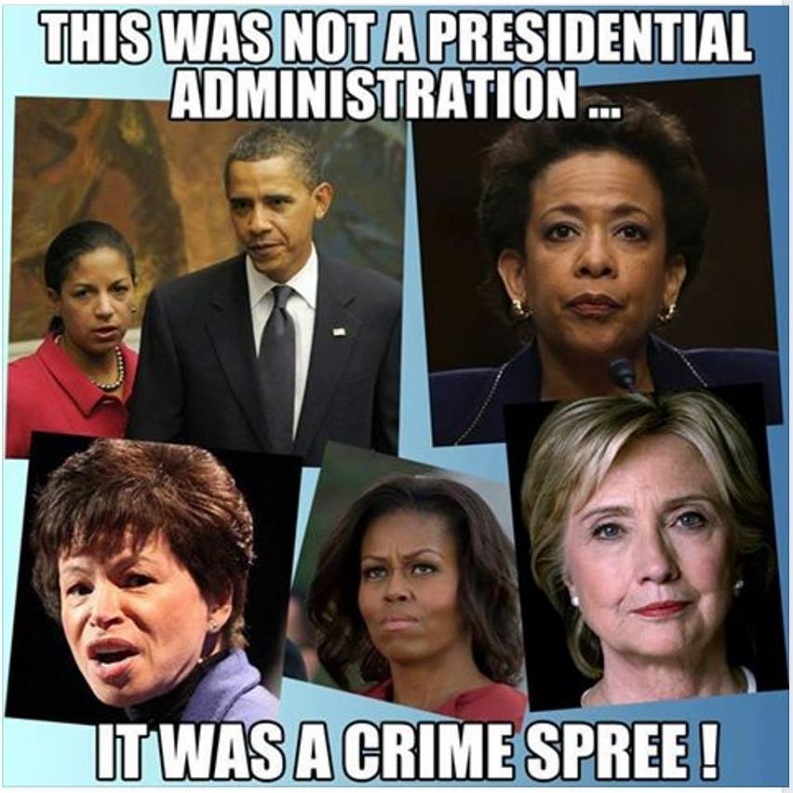 No blame is assigned to their party or ideology. When a lunatic from the right does something he/she/it is reported as representative of ALL those on the right and ALL those on the right must answer for and apologize for that behavior. I respect and admire Ben Shapiro. I almost always agree with him. But can we always take the high road? 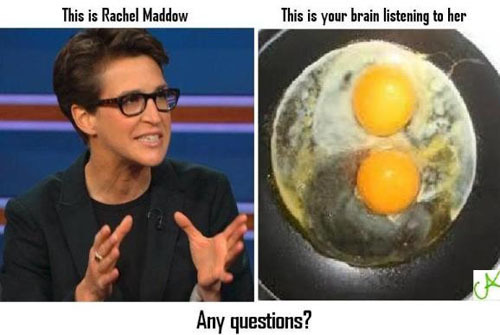 In the aftermath of a Trump-hating Bernie Sanders-supporting Rachel Maddow-watching leftist targeting Republican Congressmen for assassination, many conservatives and Republicans have fallen into the trap of blaming typical political rhetoric for the attack. I love Ben but it seems to me that taking the “high road” has gotten the right, well, shot. 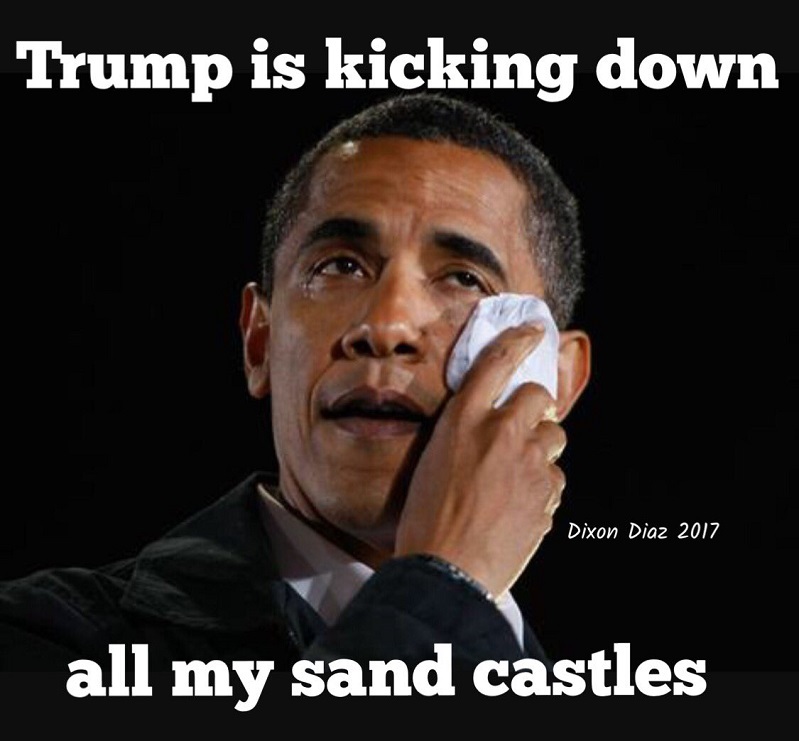 I will grant him that many of the anti-Trump and pro-Trump right have gone out of their fuzzy little minds and often speak like some loony lefty. 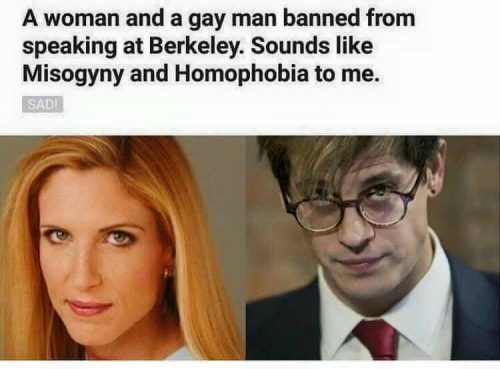 The difference is, the right is called on their nonsense, the left is not. 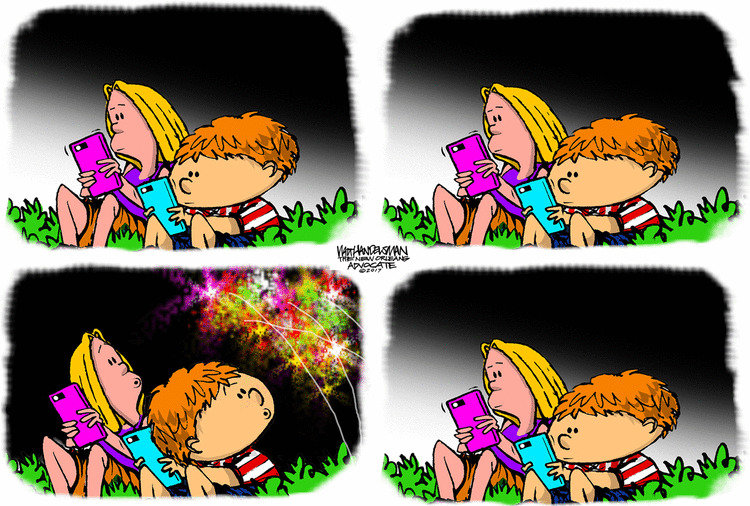 Most of the country only sees what flashes across their television screen. Far too many, in spite of voice a distrust of media, believe what they see and hear ir what they see and hear meshes with their own preconceived notions. I do know and understand that “An eye for an eye” ends with the whole world blind. I believe that. But what can honest, decent people do? How can we make this ugly language and accusations from both sides stop? Here’s the danger: Republicans, in an effort to finally turn Democrats’ “toxic politics” strategy on Democrats, legitimize the strategy. I hadn’t thought of it that way. Ben is, as he usually is, right. But can’t I be just a little angry, just a little bit willing to fight back? Please Ben. Ultimately I know that only we the people can make this stop. When we refuse to watch the ugliness and when we refuse to vote for ugly-rhetoric politicians. My problem with that is I don’t think enough of us will do that. 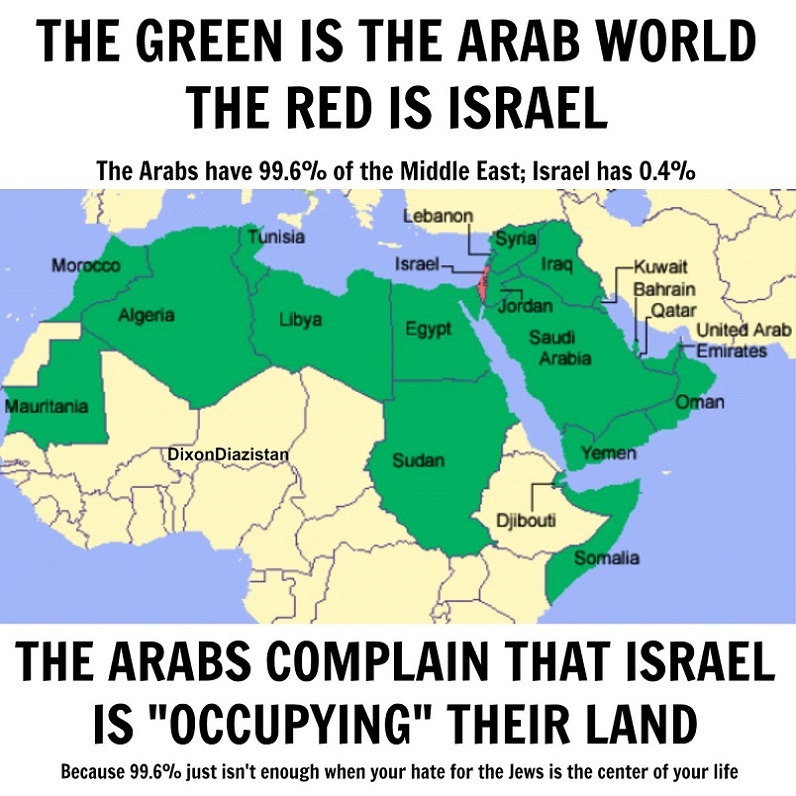 I think far too many will join the hate being spewed by their tribe. Oh how I wish I didn’t believe that. Meanwhile we can love and cherish those nearest and dearest and we can refuse to join in the ugliness. We can pray for decency and honesty to stage a comeback. Even if we are infuriated. Here’s horror story waiting to happen. You don’t think even the stupidest voters would vote for these two? 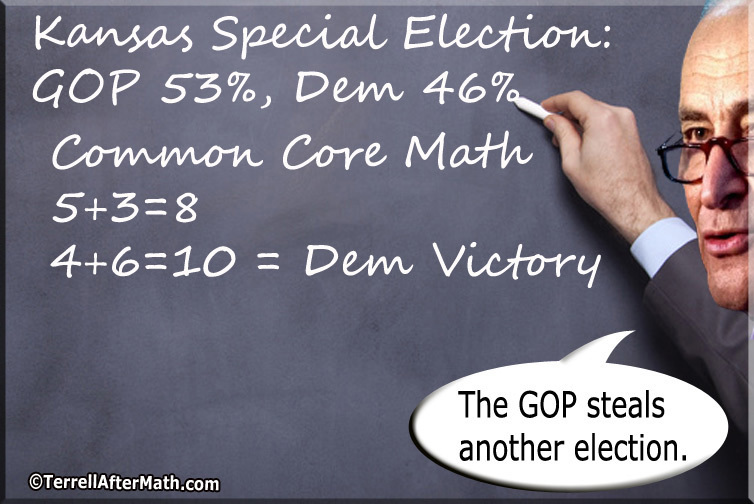 You underestimate the stupidity of the voters. I think its a dead heat. Is the image below misogynistic? And do I care if it is? 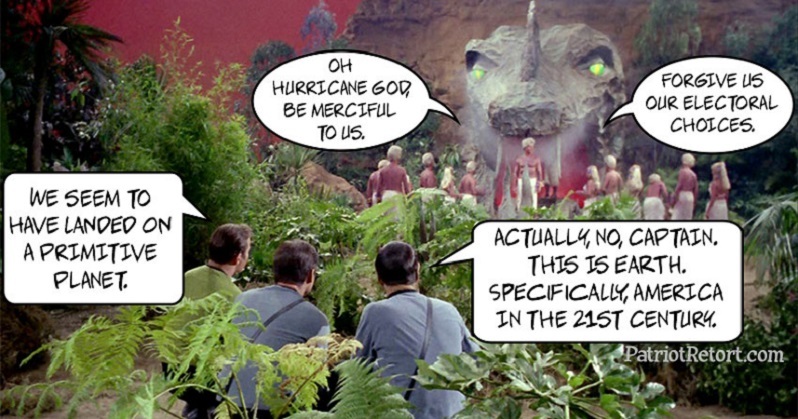 Don’t laugh – the next generation will believe this nonsense to be true! And then there’s delusional Rachel who is experiencing a big boost in ratings. Why I cannot understand but there is much I do not understand these days. 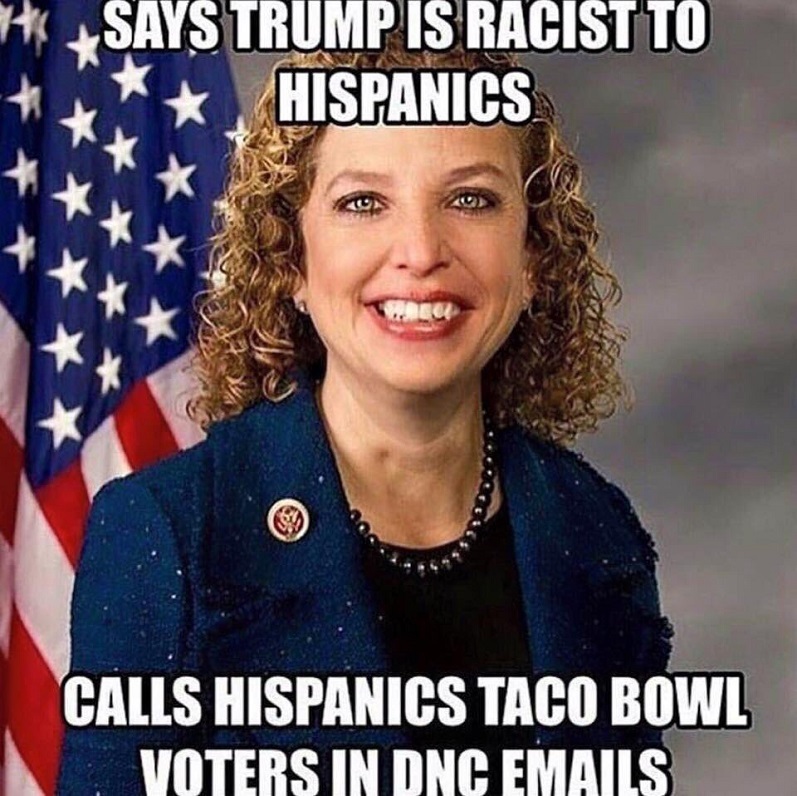 DWS – the gift that keeps on giving, to the GOP. A rotten apple from a rotten tree. 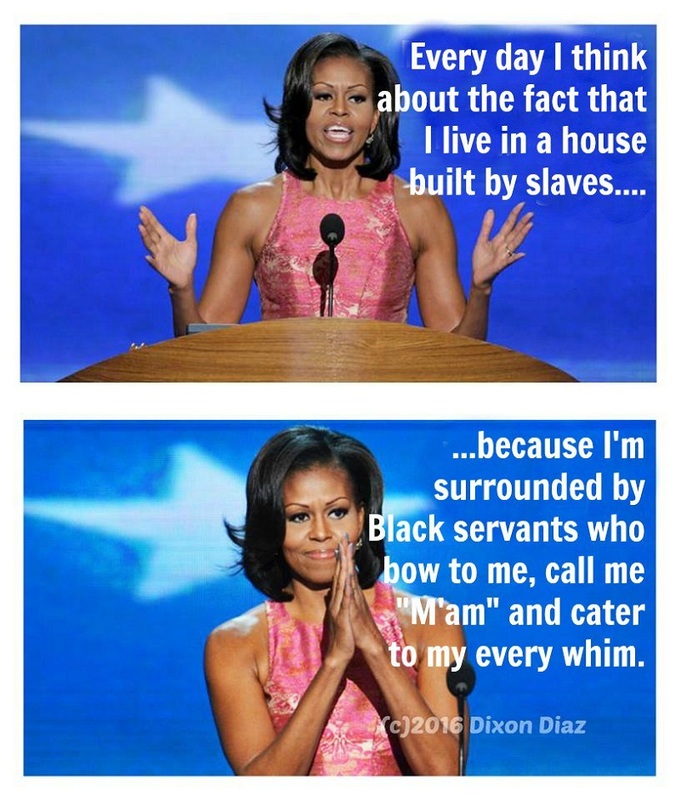 Former First Lady was a hypocrite. But what the hell, she had great biceps. A bit hyperbolic perhaps. And then perhaps not. I can add nothing worthwhile to the text accompanying the image below. 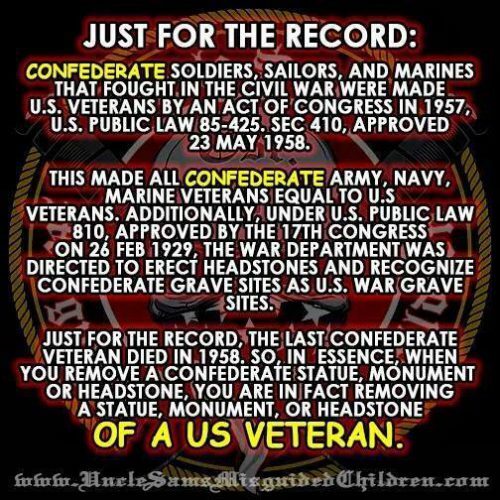 Here’s some information I didn’t know, the media doesn’t report and will not be understood by the useful idiots protesting the past by tearing down statues today. 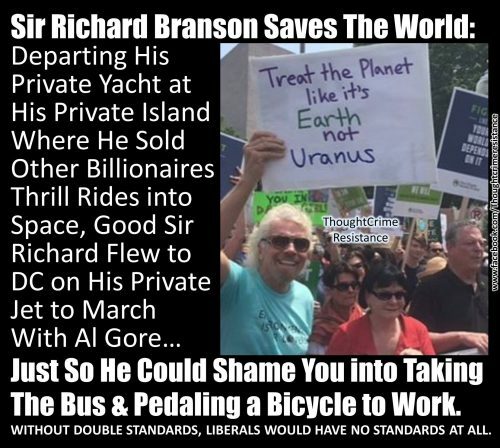 He’s one of the good rich people cause he spouts liberal propaganda. 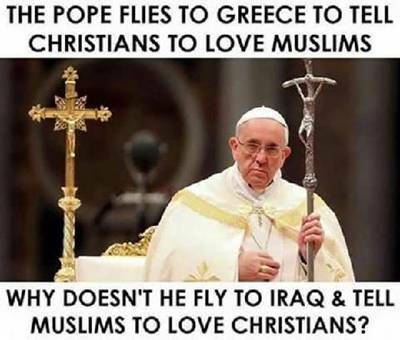 The hypocrisy of the man in full view. Some information that our crack media doesn’t bother to provide. We readily believe this man because we know he wouldn’t lie. 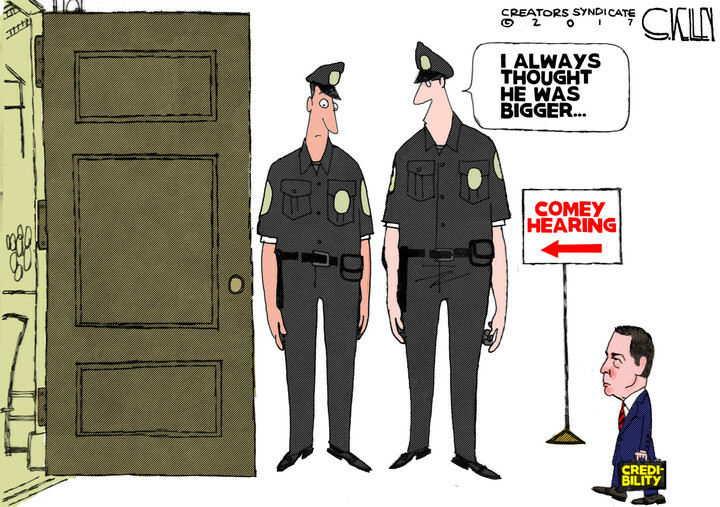 Except for that whole perjury thing. 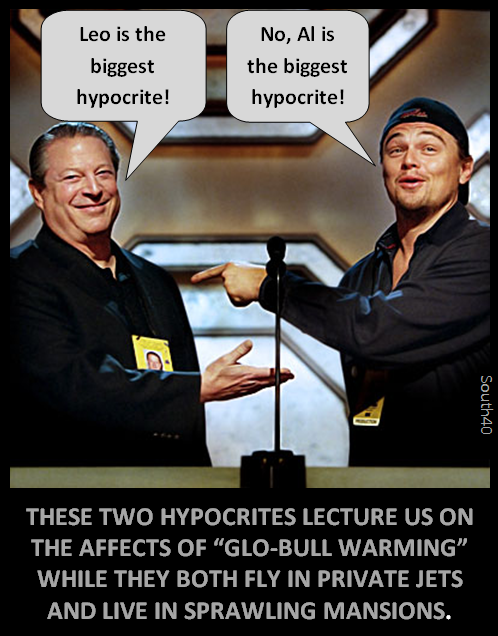 Are lectures from a liberal a good example of what is called situational irony? Just wondering. This is only an opinion but there is a lot of truth in it. And for the last image, something to think about. The right isn’t always right. They don’t even come close. But look at the alternative. So ends my diatribe in images. I hope you enjoyed them.